Regardless of the quarry – furred, finned or flying, every hunting and fishing camp across America is attended by the same 5 or 6 guys. You and I are one of those guys, so is your brother-in-law, your sibling, your buddy from work…and his buddy who tagged along at the last minute. We all possess strengths and talents, flaws and foibles. And, like it or not, this pile of quirks is crammed into every outdoor camp of which we are a part. It is said there are only three basic storylines in literature – man against man, man against nature and man against himself. How convenient for us that each of these dynamics resides in our hunting and fishing camps. It’s no wonder the best camps are short and sweet and immersed in good times and good intentions. Longer camps...maybe not so much. Bad cooking, gastrointestinal disruptions and hog-like snoring does tend to wear down one's sensibilities. From a duck camp perspective, there is but one accurate artistic rendition of this “camp life” phenomena, that being an old-time James Dwyer painting, circa 1955, with an indecipherable signature (see above). 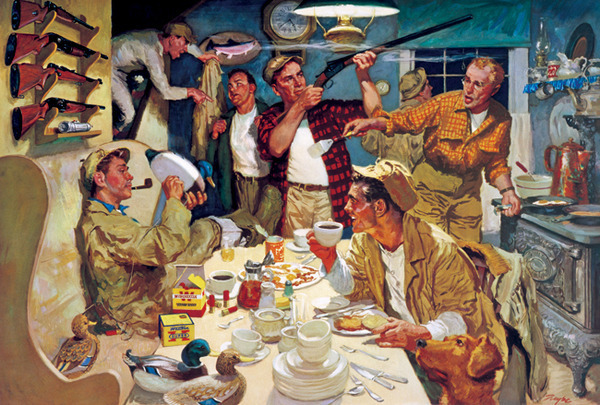 This painting depicts the scene in an early morning duck hunting camp, 4:38 a.m. to be exact. It is a print which now hangs proudly in our camp at Prairie Smoke Ranch. At the table, with hip boots and pipe, is the guy who doesn’t worry – fueled by a hot cuppa joe, he’s just rigging up decoys now, an hour before they head out. The “gun guy” fills the center, checking the bore of his favorite double to make sure it’s clean and ready for action. He's here to hunt. Worried about the weather? So is the fully-dressed guy in the background, peering out the window with a look of concern. I like to think I’m the guy at the table, enjoying the whole show while putting away a solid breakfast. And what camp would be complete without the canine clean-up crew, ready for tables scraps or errant savory bits to “fall” from the table. A golden retriever fills the role here, although our dogs are black. Drama? Sure, but it’s all good. Add a few ducks, quail, trout or deer, and you’ve got yourself a classic camp. Making memories, adding to the truly memorable building blocks of our lives. It took me awhile to track down this print but it is available for purchase in several formats. Contact Winfield Galleries at http://winfieldgalleries.com/winchester-breakfast-at-hunting-cabin/ to order your own. Great times in the great outdoors. The author is a former US Fish and Wildlife Service and US Department of Agriculture manager. In retirement he owns and operates Prairie Smoke Ranch, located in central North Dakota, the duck hunting hub of the northern plains. All rights reserved. Dwyer hunting camp image used by permission.